Eunice Kathleen Waymon’s first ambition was to become the first major Black concert pianist. 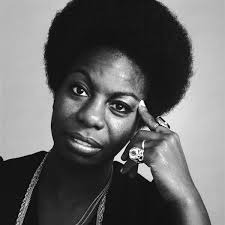 Her career took a dip, a sharp turn, and a name change, but had an unexpected resurgence when she emerged as Nina Simone, a jazz, blues, and folk singer who was soon to become one of the most highly revered musicians in American history. Eunice was born on February 21, 1933 in Tryon, North Carolina. She began her musical education at the age of three, playing piano and singing in the choir. After she graduated from high school, she pursued training at New York’s Juilliard School of Music, using money from a special fund her teacher created for her. However, she struggled to make ends meet, teaching piano and working as an accompanist. After she ran out of money, Nina and her family moved to Philadelphia in search of a more affordable music school. She applied to the Curtis Institute of Music, where she was denied admission on the basis of her race. The 50’s rolled in and the girl once known as Eunice became Nina Simone, Nina coming from the Spanish word niña and Simone from French actress Simone Signoret. Simone began to perform in clubs, accompanying herself on the piano--launching her career as a musician. Simone’s music consisted of a blend of gospel, pop, and folk combined with her skill from years of classical training. Throughout the 50’s, 60’s, and 70’s, she released several albums, her first being Little Girl Blue (1957) which featured her first Top 20 hit “I Loves You Porgy,” a song drawn from the musical Porgy and Bess. Simone also covered popular songs such as “The Times Are A-Changin’” by Bob Dylan and “Here Comes the Sun” by the Beatles. Her voice was a gritty baritone, full of soul and struggle, her struggle being the Civil Rights Movement. After Medgar Evers was killed and four girls died in the 1963 Birmingham Church Bombing, Simone came out with “Mississippi Goddam,” an emotional song of protest. “Young, Gifted, and Black,” a song that shared a title with a play by Lorraine Hansberry, a friend of Simone’s, painted pictures of the complexity as well as the power of life as a Black person. The singer was also neighbors with Malcolm X and Betty Shabazz in Mount Vernon, New York. Simone took an unexpected break from music and American politics at the end of the 60’s, traveling around the world and living in countries including Liberia, Switzerland, England, and Barbados before she settled in France. She suffered abuse from her manager turned husband, Andrew Stroud, and abused her own daughter Lisa on her part. Diagnosed with bipolar disorder, Simone battled with managers, record labels, and the Internal Revenue Service. Simone burst back onto the music scene in the 80’s when her song “My Baby Just Cares for Me” was featured in a Chanel commercial and shot up the charts in the United Kingdom. Throughout the 90’s, she released an autobiography, performed on several stages, and went to Nelson Mandela’s 80th birthday party. In addition to her autobiography, I Put a Spell on You, other creatives later came out with pieces documenting Simone’s life. The Amazing Nina Simone by Jeff L. Lieberman and What Happened, Miss Simone? from Netflix by Liz Garbus were released in 2015, as well as biopic Nina, which was released in 2016. Nina Simone passed away from breast cancer on April 21, 2003 at the age of 70 at her home in France. Eunice was a girl who wanted to be a ‘first,’ to play in great concert halls. Nina was a woman who did that and more, challenging American standards of music and advocating for change while fighting her own demons. What neither of them knew was the lasting effect the ‘High Priestess of Soul’ would have on American culture, the world, and the hearts of many.